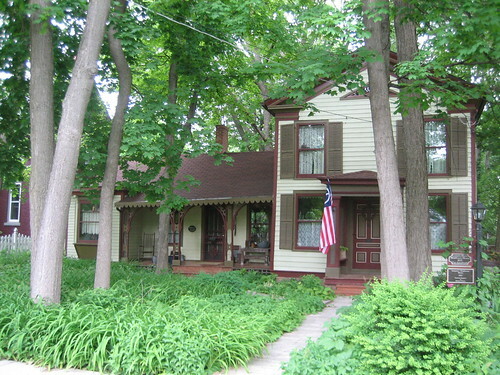 The 1838 Lampert-Wildflower House in Belvidere, Illinois, while not as architecturally impressive as, say, Frank Lloyd Wright’s work, is still a fine example of the building style known as “upright and wing“. The fairly common style refers to the nature of the building, which consists of a 2 story “upright” section and wing, or “ell” (wiki). 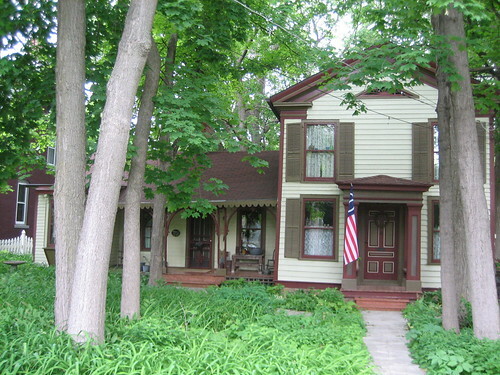 The upright portion of this house was 1838 original, the ell was added during the 1860s. As I approached the house for photographs, I was greeted by the homeowner, a local artist who operated a gallery/cafe in Belvidere. He invited me to his establishment with promises of a house tour if I showed, but I haven’t been able to get back to Belvidere since. Drats! Oh well, he was a nice person and told me that the home was the oldest extant house in Belvidere, one which he had obviously put much heart and soul into. The house stands on a block of Lincoln Avenue that is dotted with architecturally significant homes, across the street a stately (it was practically monumental – almost overwhelming) and meticulously restored Queen Anne style house. 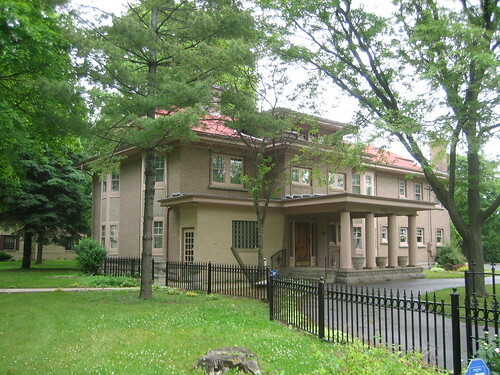 Down the block is the large 1912 Prairie-influenced J.C. Foote Residence, and the 1842 house that was Belvidere’s first brick home. 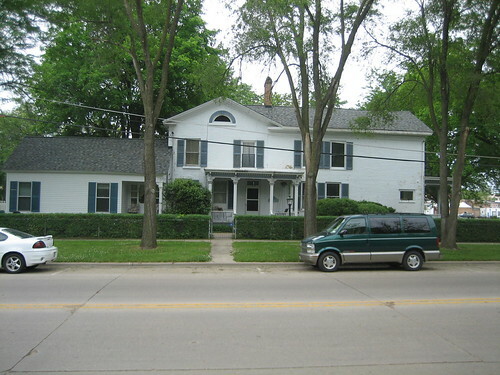 But it doesn’t seem to matter, because, though small and unassuming, the Lampert House is obvious for other reasons. The Lampert-Wildflower House was listed on the National Register of Historic Places in August 2005 (a distinction not yet afforded the surrounding homes above), included in the listing was the surrounding yard. The yard, which maintains its historic appearance, contains 32 trees and 36 other species of plants, five of those are considered “rare”. The grounds essentially form a sanctuary in the middle of an urban area; the Lamperts were naturalists who maintained the yard for wildlife and plant life alike. Today, the yard is considered “semiwooded”. I provided information in far greater detail over at the Wikipedia entry for the Lampert-Wildflower House, venture there, or, get it straight from the horse’s mouth: I compiled most of the Wikipedia entry from the National Register nomination form I have linked below. *National Register archives interior photos: 1, 2 and closeups of the entryway and the ell. A brief stop in DeKalb is up next, and then over to Ogle County as promised. Stay tuned. This is some great information. I’ll be following your trip through Illinois with some interest. I live in Spring Grove now. I used to live in Palatine and Round Lake Beach. I’m putting your blog on my favorites.